b) traffic lanes for cars are reduced. These are both political death for any politician. The society here is completely auto-dependent and quite hostile to cyclists. In these circumstances (common throughout the western world) how do you suggest a political consensus be built for the separated cycle infrastructure you propose? Absolutely - London's roads are so narrow that they have to put the taxi ranks in the middle, because there's parking on both sides. Note that in this case, the traffic islands and central taxi ranks are detritus of two way running despite this street having being one way for many years now. First of all road widths are set from a national design guidebook for roads. In the US, allowed widths are from 10-13 feet for typical urban 30mph roads. Many of these roads are 12feet+ and very few places have something closer to 10ft. However in many situations lowering the speed to 20 or even 25 as a first step, and re-stripping to lane widths of 10ft and maybe 9 depending on traffic and truck usage. This still provides for on street parking which again is set as a national standard (typically). One thing they do is provide extra width due to people not wanting to hit their tires on the curb, you will note that many people who park real close to the curb have another foot to 2feet between them and a typical space line. This is important because many Dutch paths along the inside of parked cars are at the road level, and thus no risk of hitting the curb, the separation from the roadway is the cars marked by a different pavement marking and very low side paving stones and curbed trees/grass at corners and other places along the road. A pedestrian path seems to be elevated in some areas and not in others; my bet is it depends on the amount of separation between the pedestrian and car traffic, eg no need for it to be elevated significantly if there is a bicycle path, parking and then the road, the separation is obvious. So the trick is to start advocating for slower speeds in urban areas, or for towns to set their own urban speeds eg the state (for the US) sets a road at 35mph a town can set it at anything under that down to 15mph. Advocating for the design guidebook to allow for 8ft-10ft lanes where there is not a large amount of truck traffic, or if not then allowing the minimum road width to be at least 8 or 9 feet, this allows areas that wish to make smaller roads not have to go through a mess filling out exemptions. Exemptions can take time money and a superb knowledge of the rules and luck that the exemption would be approved. Closing off a street for festivals or events can help, as can Park(ing) Day activities. Many of the road designs that provide for cyclists make the road safer, for pedestrians, cyclists, and drivers, they can also make the air better, reduce runoff, and can reduce urban noise (which can be a significant health problem). The first step I think is to get your local politicians out on a bicycle, to see the environment as you do, that can sometimes do more than any advocating work. Once they see the problems (hopefully), offer them examples that show how it can be done right, yes it might be expensive up front but it has to start somewhere. Vehicular cyclists will start talking but they have nothing, no proof that their way of bicycling has any impact on getting people on a bicycle that choose to (not need to because they are poor, lost their license or are too young). Good luck to you :) there are many folks trying to overcome the problems we have, we are all in it together! Here in Los Angeles it is similar to Sydney. We too need to remove traffic lanes or remove parking. However, we also have certain streets which are rather narrow by car centric standards. One street in my hometown springs to mind: it is a relatively short street, only running about a mile from end to end, it services a bus route and is mostly residential housing with a corner store, cafe, two schools and a park on it. It is very difficult to imagine a more bike friendly rendering of the street. It can't really cut off drivers as a bus needs to go through and I am currently taking measurements, I think at best, there can be a narrow one way separated cycle path without lane or parking removal. I have this idea that at certain points the street is narrowed to a single passing in the middle which states buses and bikes may go through but private cars must turn. That's about all I can think of. The street is Yosemite Drive in Eagle Rock, Los Angeles if anyone is interested. Cars aren't too happy to share the street as it is, yesterday my friend and I were honked at for absolutely no reason other than we forced a car to serve around us. This blog continues to inspire and I am optimistic change will happen eventually. All very good and welcome evidence. The planning authority for my "home" town of Brackley have just published an expansion plan for a population increase of 30% in the period to 2026. Poor "legibility" of pedestrian and cycle ways is identified, along with a shortage of car parking (oh what a surprise). A small area of shared "use" is suggested - pretty much what we already have - the rest will no doubt be the blue paint solution. There is no suggestion of segregated cycle routes nor of any help leaving the town and crossing the diabolically busy A43 four lane dual carriage way. We have roads plenty wide enough for cycle lanes, the main road through the town centre is an incredible five lanes wide being an old market place. I am scripting my comments to the planners to highlight the pressure (read wasted space)that car parking has put on the landscape. 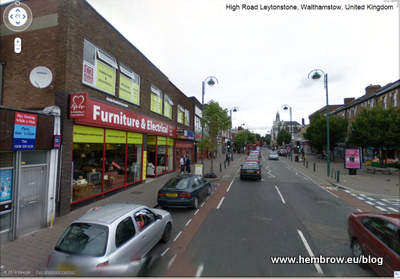 Then first photo shows High Road Leytonstone, where it would be perfectly feasible to go Dutch. The problem is that car parking is perceived as a higher priority than either walking or cycling, and in Leytonstone both footways and road space are allocated for car parking, which is either free, or at best charged at a minimal rate. What I find interesting is that in some wards of this borough up to 49 per cent of households don't own a car, yet the car remains the top transport priority. One problem in challenging the status quo is that many cycling campaigners and cycling groups actually support it. They have spent their lives as vehicular cyclists and perceive progress as involving the amelioration of vehicular cycling conditions rather than accepting that this will never result in mass cycling. The euphoria which has greeted the new London bike hire scheme seems to me characteristic of this tendency, in so far as people are saying it will be the tipping point for cycling in London, resulting in the city resembling Copenhagen in ten years time. Apart from the problem of designating Copenhagen as the iconic city for cycling, the figures don't stack up. The tragedy for London is that the necessary work on transforming the city for cycling simply hasn't started, and there are no signs of it starting in the future. Thank you. 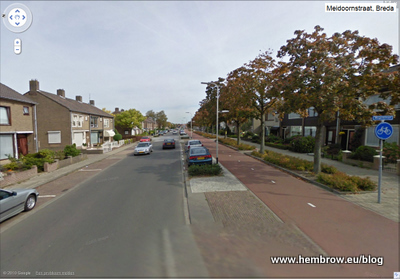 It's good to see some more examples of how the Dutch would lay out similar width roads. And if you have more that would be great. Especially for any narrower widths. How to get the social/political situation that this could happen in the UK I am not quite so sure. THere are many 2-way urban roads in the UK that are too narrow for improved cycling facilities, but they can be picked out by the presence of double yellow lines by the curb, 2 lanes and the and narror footpaths. Pretty much everything else comes down to a question of priorites. I find it offensive that someone can (and is encouraged to) use public space to 'store' their car. One parked car on a two lane road effectively reduces it to one lane anyway. All this at the expense of space for pedestrians & cyclists. It should be banned in our suburbs too. 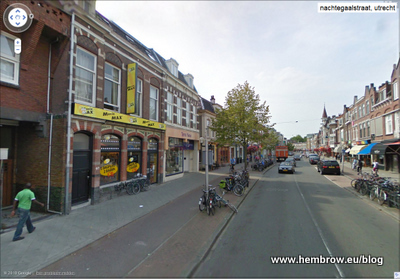 All my local streets are wide enough for Dutch infrastructure but only if on-street parking is banned. "There is no suggestion of segregated cycle routes nor of any help leaving the town . . ."
My God, man! That would require that ordinary people would have to travel two, maybe even three miles by BICYCLE! You can't expect a city to take that sort of trouble and expense just to cater to a few elite athletes and super humans. I am very surprised by most comments. 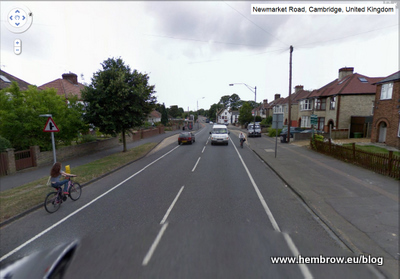 What I see in the pictures IS on street parking AND separate cycle infrastructure AND the same number of car lanes. On the second pair David shows, there is NO on street parking in the English picture. But on a street of the same width with the same type of houses there IS on street parking in the Dutch picture AND a two way separate cycle path. Far better use of available space in my opinion. Maybe it is because I know the Dutch situation and I have seen English, American and Australian streets that it is more obvious to me, but I thought it was all too clear. The whole point of this post seems to me to show this: Because it is possible in the Dutch narrow streets to have on street parking as well as separate cycle paths and the same number of car lanes, it means that it is possible everywhere. It seems where the Dutch have implemented bike paths, the English speaking countries have super wide planted medians and greenery between the parked cars and sidewalk. I can certainly speak for some neighborhoods of Los Angeles, we waste (in my opinion) space on grass which is difficult to maintain when the same amount of space could have been used for a separated bike path. What you say is certainly the case here in Manchester,UK and much of the rest of Britain. We have massive swathes of useless grassy areas either beside or inbetween large carriageways (or both). These areas are not used for anything whatsoever - all year round. Yet they require constant mowing and litter picking - using up council money. The waste of this design is obvious to anyone who actually bothers to analys. But you can gaurantee the any new carriageway to be built in UK towns will follow the same old tried and failed layout. Thanks for this David, really useful. Of course in general the cycle path provision is apalling in the UK, but it is slowly improving. I'd just like to flag up that the 'cycle superhighway' that manages to completely avoid Elephant and Castle roundabout in South London is literally a lifesaver. I was forced to cycle round that monstrosity of bad planning praying under my breath not to die for several years, so now that there is a nice blue diversion I am giving (some, small) credit to Boris. is there a particular scehme that the dutch use that determines if a road gets a painted bike lane or a separated bike path along or nearly parallel to the road??? and can that be found in english (or dutch) online?? ?